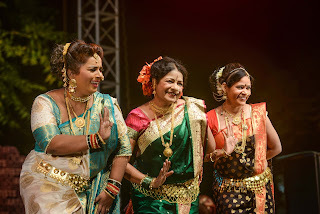 Lavani is a traditional dance form of Maharashtra with a rich heritage of several centuries, which involves direct interaction between the artistes and the audience. The performer communicates with the audience through her singing, abhinaya and dance. Although lavani is gaining popularity since last few years, its portrayal in popular media is limited to being just an item number. Sangeet Bari combines multiple narratives such as the lavani woman, the musicians, the customer and the researcher/narrator. It also includes live performances of old traditional lavanis, which are either unknown or forgotten. Also, this time, Sangeet Bari is joining the celebrations of Pride Month by presenting a special lavani song performed by Anand Satam and Ashimik Kamthe as part of the show. The artists aim to give the audience a fun-filled evening, showcasing a gender-fluid, all-inclusive, modern face of lavani which is not fully explored. Join in this celebration of Lavani and Lavani Queens! Cast: Pushpa Satarkar, Akanksha Kadam, Latabai Waikar, Chandrakant Lakhe, Sunil Jawale, Vinayak Jawale, Shakuntalabai Nagarkar, Savitri Medhatul & Bhushan Korgaonkar. Special Performance by: Anand Satam & Ashimik Kamthe.